Tiny House | Small Change: Real Estate Investing. For Everyone. This offering is closed. Look for another one! Affordable. Walkable. Different. The first of its kind to be constructed in Pittsburgh, this tiny house is poised to make a big impact in Garfield. 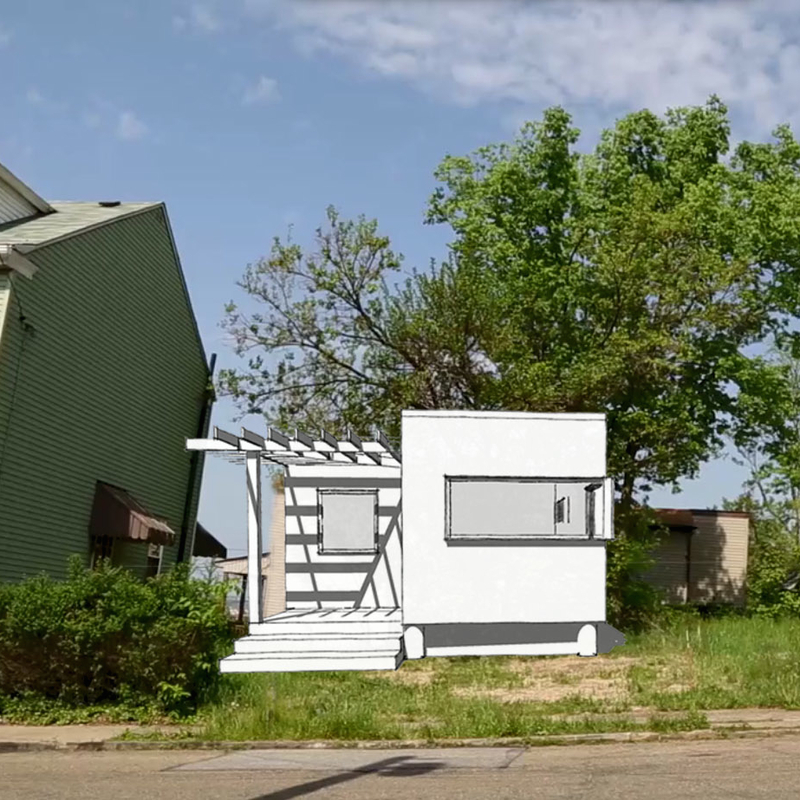 This is an opportunity to invest in Tiny House LLC, which will make a loan to cityLAB, Inc. for the construction of a tiny house on a vacant lot located in the neighborhood of Garfield in Pittsburgh, Pennsylvania. The tiny house brings an entry market of inexpensive, tiny homes to the underserved Garfield neighborhood. Located at 223 N. Atlantic Avenue, the tiny house is just a few miles from bustling downtown Pittsburgh and less than a mile from East Liberty, an increasingly desirable neighborhood full of restaurants, supermarkets, shops and startups. The tiny house is the first of its kind to be constructed within the City of Pittsburgh, filling a need for a new infill housing type to meet increased demand for housing, and creating opportunity for neighborhood economic development. The money raised in the offering along with other financing acquired by cityLAB, will be used to construct the tiny house. Construction of the tiny house began at the end of August 2015 and is expected to take between four and six months to complete, weather permitting. During construction cityLAB will market the house for sale to a homeowner and sell the house as soon as possible upon completion. 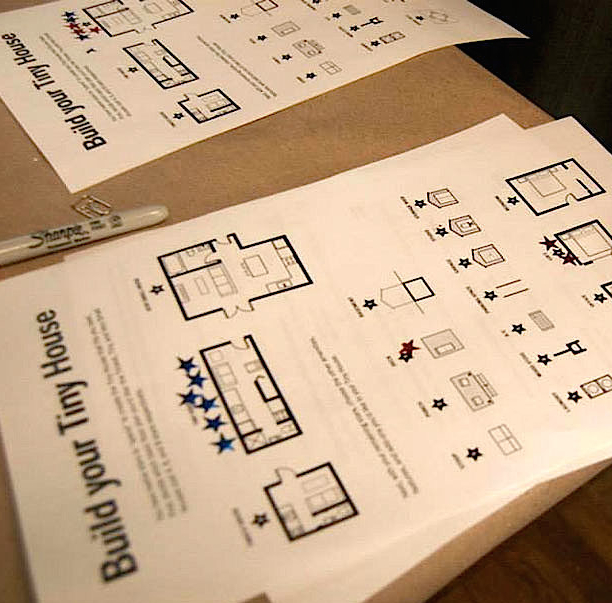 cityLAB is planning to use a sealed–bid auction process to solicit bids on the tiny house, since there is no comparable market in Pittsburgh. You can follow construction progress for the tiny house here. The loan to cityLAB will bear interest at 7.5% per year. cityLAB will not pay interest currently but intends to pay all accrued interest on the loan, together with all outstanding principal, upon a successful sale of the tiny house. The loan also provides that the minimum interest that cityLAB must pay is 7.5%; so, if the loan is repaid in full in less than a year, cityLAB will pay (and investors, in turn, will receive) a full year’s interest on the loan. There has long been interest in living small (The Not So Big House (1997); Shelter (1973)). Jay Shafer who designed and lived in a 96 square foot house and went on to found the Tumbleweed Tiny House Company popularized tiny houses on wheels. And in 2005, after Hurricane Katrina, Marianne Cusato developed the Katrina Cottages, homes that are as small as 308 square feet and originally provided an alternative to FEMA trailers. By 2007, the average size of a new single family home in the United States had grown to 2,479 square feet. At the same time, the average household size of the American family was at an historic low (2.56 people per household). As a result of this mismatch of product and needs, and most tellingly, the financial crisis, interest in living simply and small grew out of necessity. The Urban Land Institute report, "America in 2015: A ULI Survey of Views on Housing, Transportation and Community", reported that half of the Americans surveyed prefer walkable neighborhoods with sidewalks, crosswalks and other pedestrian-friendly features; 52% of Americans would like to live in a place that is not car-dependent, 78% of people would rather live in a community with a mix of ages and 66% would prefer a mix of cultures and backgrounds. cityLAB’s tiny house brings an entry market of inexpensive, tiny homes to Garfield, an underserved neighborhood of Pittsburgh. Located at 223 N. Atlantic Avenue, the tiny house is just a few miles from bustling downtown Pittsburgh and less than a mile from East Liberty, an increasingly desirable neighborhood full of restaurants, supermarkets, shops and startups. In fact, Garfield has many of the amenities that respondents preferred in the Urban Land Institute’s study "America in 2015: A ULI Survey of Views on Housing, Transportation and Community" such as a walkable, central location and proximity to community assets like shopping and entertainment. cityLAB’s tiny house is just under 350 square feet and is being built on a lot which measures just over 1,000 square feet. It embodies modern design with its clean, simple lines and attached porch with open crosshatch roof. Sited at the rear of the lot and fronted by a garden, the tiny house features a large wraparound corner window allowing natural light to fill the space, and a kitchen designed with chefs in mind. It is laid out on one level creating a fantastic blank slate for a new owner to make it their home. And it will be sold by sealed-bid auction for a minimum of $99,500. Depending on the purchase price and current borrowing interest rates, the buyer of the tiny house will have monthly PITI (principal, interest, taxes and insurance) payments that are very reasonable and competitive. 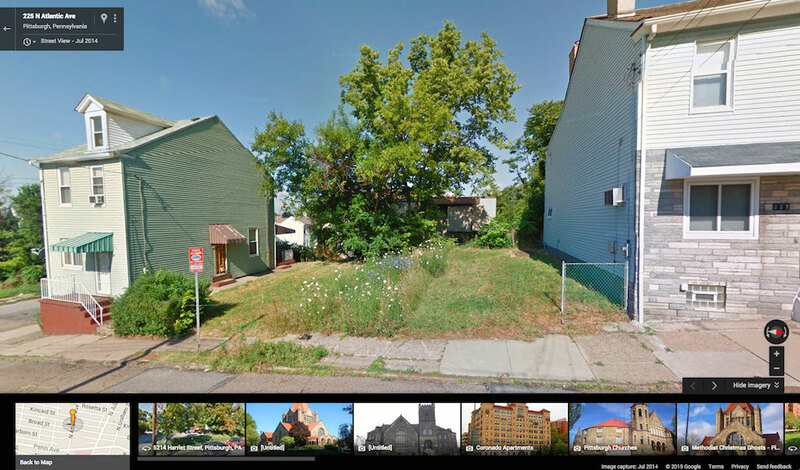 While land values are still low in Garfield, the neighborhood is showing rapidly increasing interest from developers, making this an opportune time to invest in the regrowth of the area. Tiny houses on small vacant lots are the perfect urban infill and will begin to stitch the community together with good neighbors who will care for their property and drive economic growth in the area. 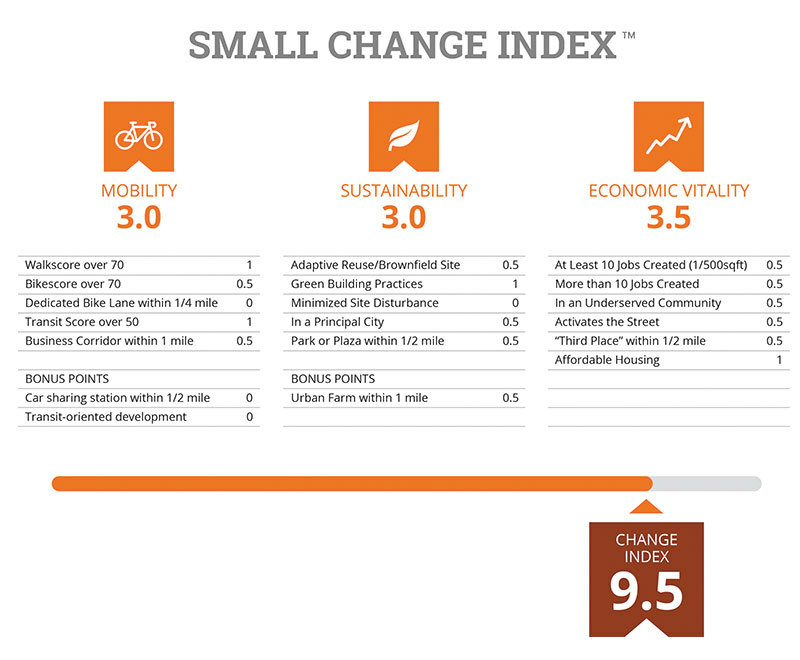 If you'd like more information about our Small Change Index, read here. Garfield is a Pittsburgh neighborhood with a population of approximately 3,675 covering 0.457 square miles. The neighborhood is about three miles from the confluence of the Allegheny, Monongahela and Ohio Rivers at the city's heart and is bordered by these other Pittsburgh neighborhoods: Bloomfield, Friendship, East Liberty, Highland Park, Stanton Heights and Lawrenceville. Garfield has suffered from declining economic conditions for decades and has been the focus of significant work by the neighborhood community development corporation, the Bloomfield Garfield Corporation, and the City of Pittsburgh. According to real estate site Trulia, Garfield currently has just over 2,100 housing units. The median home sales price for the period April 2015 through June 2015 was $116,600 with an average per square foot price of $74. By contrast, the median home sales price for Pittsburgh during the same period was $149,000. Five years ago during the same period, the median home sales price in Garfield was $85,250 and in Pittsburgh was $122,250. Some of the neighborhoods that surround Garfield, particularly East Liberty, have experienced significant economic development and revitalization in recent years, after years of economic malaise. Successful retail stores such as Whole Foods, Trader Joe’s, Target and TechShop have located in East Liberty, less than a mile to the east of the Property. 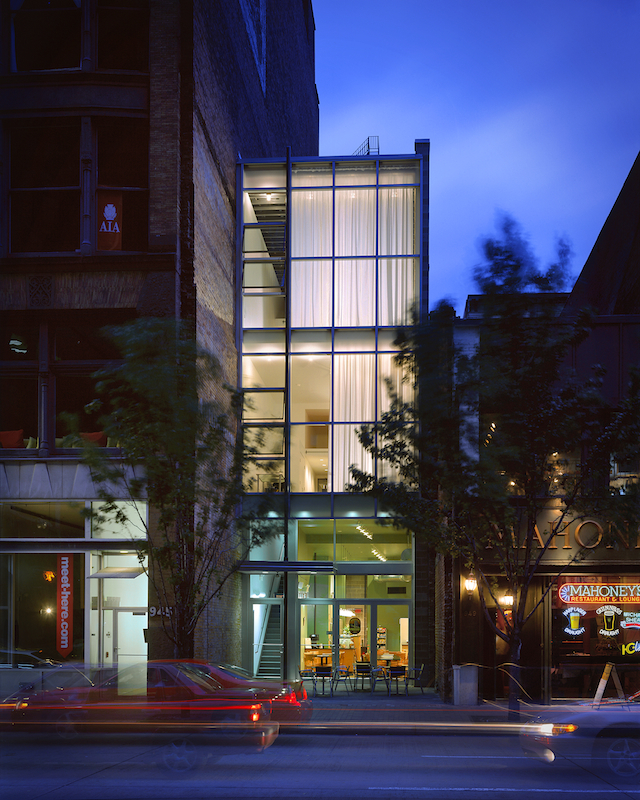 Google’s offices in East Liberty, which started small, have expanded rapidly and East Liberty has as a result become a popular location for business start-ups and new business incubation. At the same time several multi-unit residential buildings have been developed, the latest of substantial scale. To the west and to the south, three major hospitals have flourished, feeding the need for housing. As some surrounding neighborhoods have flourished, many have begun to focus on those neighborhoods that have seen less activity to date, such as Garfield, and to wonder if East Liberty’s recent economic growth will spread to them as well. Buying and building a new house is an increasingly expensive proposition in the Pittsburgh area, and the tiny house is a great solution. Due to the compressed footprint, small plots of previously unusable urban land can now accommodate a new home. The total amount necessary to build the tiny house is approximately $191,000. In addition to the loan, cityLAB will receive funds from several sources including the Urban Redevelopment Authority of Pittsburgh (the “URA”) and Neighborhood Allies. These are outright grants and do not need to be repaid. The Bloomfield Garfield Corporation (BGC), the local neighborhood community development corporation, has also received a grant that it will invest directly into preparation of the land. These funds also need not be repaid. Centrally located. The house is in a centrally located emerging neighborhood in Pittsburgh’s East End, where development has boomed over the last 10 years. Much needed home product. The house is very affordable, with monthly PITI payments (principal, interest, taxes and insurance) that are very competitive with the current market in Pittsburgh’s East End. Walkable. The house is located close to public transit and just a few blocks from a main street with retail shops, restaurants and coffee shops; less than a mile from Whole Foods supermarket and the Eastside shops and just over a mile to a large Target store. Close to jobs. The house is located on a major bus route to downtown, which is just 4.1 miles away, and only 2.1 miles from Oakland, the second largest job center in Pittsburgh. Returns. Investors may receive a full 7.5% return even if funds are held for less than a year. If cityLAB is unable to find a buyer for the tiny house, cityLAB may choose to hold the tiny house for several years and rent it instead until a buyer at a suitable price is found. Rents in the surrounding neighborhoods are relatively high so that a rental fallback scenario may provide time for the market to mature and a buyer to be found. cityLAB must repay the loan no later than three years from its start date. cityLAB has assigned almost $15,000 in project cost to unforeseen contingency items. $109,500. That's what it took to buy the tiny house. With its tiny footprint, reflective roof, high-quality thermal pane windows and well-insulated doors, the tiny house was not only be affordable to buy, but will also be affordable to live in. Monthly principal, interest, property tax and insurance payments are estimated to be around $750 per month*. A prospective buyer with a gross monthly income of $36,000 annually would probably qualify to purchase the tiny house**. And the developer has applied for Act 42 residential property tax abatements, which could make it even more affordable to live in. Want to know more? Email the developer at info@cityLABpgh.org, and she'll get right back to you. This Tiny House is SOLD. cityLAB CEO Eve Picker brings over 20 years of development experience in successfully bringing transformational urban projects to life. Through her firm, no wall productions inc. (and the affiliated we do property management, inc.) Picker has successfully transformed numerous neglected urban buildings into highly-desirable spaces ready for residential and commercial use and through cityLAB, Picker has implemented ‘urban experiments’ that seed economic development, attract talent, create buzz and effect positive change in the city. Read more about cityLAB here , and see no wall’s projects here.